Crelin Arthur Walford Bodie was born at Kirton, Suffolk in April 1920 and went to Ipswich School. He joined the RAF on a short service commission in October 1939. With his flying training completed, Bodie went to 66 Squadron at Duxford in May 1940. On 8th July he claimed a He111 destroyed, on 19th August shared a probable He111 and on the 20th he shared in destroying two Me110's. 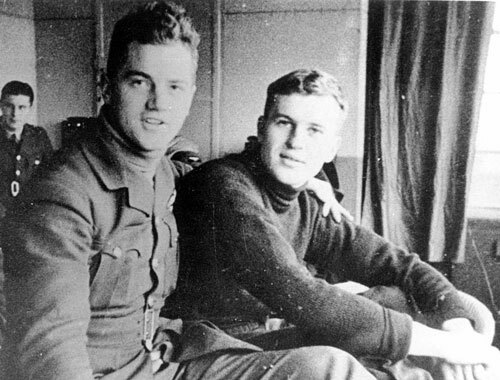 Above: Bodie (left) with P/O JB Kendal at 66 Squadron. Above image courtesy of Gravesend Airport Heritage Project. On the 31st Bodie shared a Do17, on 2nd September shared a He111, on the 4th got a probable Me109, on the 6th damaged two Me109's, on the 11th destroyed a He111 and on the 15th destroyed two Do17's and shared in the destruction of two others. Bodie claimed a He111 destroyed on 18th September, a Me109 probably destroyed on the 24th, a Ju88 damaged on 5th October, a Me109 destroyed on the 11th, two more probably destroyed and two others damaged on the 12th and three probably destroyed on the 13th, 25th and 14th November. He was awarded the DFC (gazetted 8th November 1940). In March 1941 Bodie was posted to 310 Squadron at Duxford as a Flight Commander. He moved to 152 Squadron at Portreath in June 1941. He was killed aged 21 in a flying accident on 24th February 1942 when Spitfire IIA P8077 spun into the ground at Eglinton. Bodie is buried in the churchyard of St. Canice, Eglinton, County Antrim, Northern Ireland.